Streptococcus pneumoniae, or pneumococcus, is a Gram-positive, alpha-hemolytic (under aerobic conditions) or beta-hemolytic (under anaerobic conditions), facultative anaerobic member of the genus Streptococcus. A significant human pathogenic bacterium, S. pneumoniae was recognized as a major cause of pneumonia in the late 19th century, and is the subject of many humoral immunity studies. S. pneumoniae resides asymptomatically in the nasopharynx of healthy carriers. The respiratory tract, sinuses, and nasal cavity are the parts of host body that are usually infected. However, in susceptible individuals, such as elderly and immunocompromised people and children, the bacterium may become pathogenic, spread to other locations and cause disease. S. pneumoniae is the main cause of community acquired pneumonia and meningitis in children and the elderly, and of septicemia in HIV-infected persons. The methods of transmission include sneezing, coughing, and direct contact with an infected person. Despite the name, the organism causes many types of pneumococcal infections other than pneumonia. These invasive pneumococcal diseases include bronchitis, rhinitis, acute sinusitis, otitis media, conjunctivitis, meningitis, bacteremia, sepsis, osteomyelitis, septic arthritis, endocarditis, peritonitis, pericarditis, cellulitis, and brain abscess. S. pneumoniae is one of the most common causes of bacterial meningitis in adults and young adults, along with Neisseria meningitidis, and is the leading cause of bacterial meningitis in adults in the USA. It is also one of the top two isolates found in ear infection, otitis media. Pneumococcal pneumonia is more common in the very young and the very old. It also is a major bacterium for invasive diseases like pneumonia and meningitis in South Asian children 12 years of age, though the evidence is of low quality and scarce. S. pneumoniae can be differentiated from the viridans streptococci, some of which are also alpha-hemolytic, using an optochin test, as S. pneumoniae is optochin-sensitive. 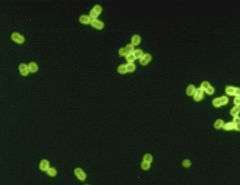 S. pneumoniae can also be distinguished based on its sensitivity to lysis by bile, the so-called "bile solubility test". The encapsulated, Gram-positive coccoid bacteria have a distinctive morphology on Gram stain, lancet-shaped diplococci. They have a polysaccharide capsule that acts as a virulence factor for the organism; more than 90 different serotypes are known, and these types differ in virulence, prevalence, and extent of drug resistance. In 1881, the organism, known later in 1886 as the pneumococcus for its role as an etiologic agent of pneumonia, was first isolated simultaneously and independently by the U.S. Army physician George Sternberg and the French chemist Louis Pasteur. The organism was termed Diplococcus pneumoniae from 1920 because of its characteristic appearance in Gram-stained sputum. It was renamed Streptococcus pneumoniae in 1974 because it was very similar to streptococci. S. pneumoniae played a central role in demonstrating that genetic material consists of DNA. In 1928, Frederick Griffith demonstrated transformation of life, turning harmless pneumococcus into a lethal form by co-inoculating the live pneumococci into a mouse along with heat-killed, virulent pneumococci. In 1944, Oswald Avery, Colin MacLeod, and Maclyn McCarty demonstrated the transforming factor in Griffith's experiment was DNA, not protein, as was widely believed at the time. Avery's work marked the birth of the molecular era of genetics. The genome of S. pneumoniae is a closed, circular DNA structure that contains between 2.0 and 2.1 million base pairs, depending on the strain. It has a core set of 1553 genes, plus 154 genes in its virulome, which contribute to virulence, and 176 genes that maintain a noninvasive phenotype. Genetic information can vary up to 10% between strains. Natural bacterial transformation involves the transfer of DNA from one bacterium to another through the surrounding medium. Transformation is a complex, developmental process requiring energy, dependent on expression of numerous genes. In S. pneumoniae at least 23 genes are required. In order for a bacterium to bind, take up and recombine exogenous DNA into its chromosome it must enter a special physiological state, called competence. Competence, in S. pneumoniae, is induced by DNA-damaging agents such as mitomycin C, a DNA inter-strand cross-linking agent, and the fluoroquinolone antibiotics norfloxacin, levofloxacin and moxifloxacin, topoisomerase inhibitors that cause double-strand breaks. Transformation protects S. pneumoniae against the bactericidal effect of mitomycin C. Michod et al. summarized evidence that induction of competence in S. pneumoniae is associated with increased resistance to oxidative stress and increased expression of the RecA protein, a key component of the recombinational repair machinery for removing DNA damages. On the basis of these findings, they suggested that transformation is an adaptation for repairing oxidative DNA damages. S. pneumoniae infection stimulates polymorphonuclear leukocytes (granulocyte) to produce an oxidative burst that is potentially lethal to the bacteria. The ability of S. pneumoniae to repair the oxidative DNA damages in its genome, caused by this host defense, likely contributes to this pathogen’s virulence. Consistent with this liklihood, Li et al. reported that, among different highly transformable S. pneumoniae isolates, nasal colonization fitness and virulence (lung infectivity) depend on an intact competence system. S. pneumoniae is part of the normal upper respiratory tract flora, but, as with many natural flora, it can become pathogenic under the right conditions, like if the immune system of the host is suppressed. Invasins, such as pneumolysin, an anti-phagocytic capsule, various adhesins and immunogenic cell wall components are all major virulence factors. Once it colonizes the alveoli, the body responds by stimulating the inflammatory response. This causes plasma, blood, and WBC's to fill the alveoli, This condition is called pneumonia. Both Haemophilus influenzae (H. influenzae) and S. pneumoniae can be found in the human upper respiratory system. A study of competition in vitro revealed S. pneumoniae overpowered H. influenzae by attacking it with hydrogen peroxide. When both bacteria are placed together into the nasal cavity of a mouse, within 2 weeks, only H. influenzae survives. When both are placed separately into a nasal cavity, each one survives. Upon examining the upper respiratory tissue from mice exposed to both bacteria, an extraordinarily large number of neutrophil immune cells were found. In mice exposed to only one bacterium, the cells were not present. Lab tests show neutrophils that were exposed to already-dead H. influenzae were more aggressive in attacking S. pneumoniae than unexposed neutrophils. Exposure to killed H. influenzae had no effect on live H. influenzae. The combination of the two species sets off an immune system alarm that is not set off by either species individually. It is unclear why H. influenzae is not affected by the immune system response. Diagnosis is generally made based on clinical suspicion along with a positive culture from a sample from virtually any place in the body. An ASO Titre of >200 units is significant. S. pneumoniae is, in general, optochin sensitive, although optochin resistance has been observed. ↑ Ryan KJ, Ray CG, eds. (2004). Sherris Medical Microbiology. McGraw Hill. ISBN 0-8385-8529-9. 1 2 Siemieniuk, Reed A.C.; Gregson, Dan B.; Gill, M. John (Nov 2011). "The persisting burden of invasive pneumococcal disease in HIV patients: an observational cohort study". BMC Infectious Diseases. 11: 314. doi:10.1186/1471-2334-11-314. PMC 3226630 . PMID 22078162. ↑ Dagan R (2000). "Treatment of acute otitis media—challenges in the era of antibiotic resistance". Vaccine. 19 (Suppl 1): S9–S16. doi:10.1016/S0264-410X(00)00272-3. PMID 11163457. ↑ Jaiswal, Nishant; Singh, Meenu; Thumburu, Kiran Kumar; Bharti, Bhavneet; Agarwal, Amit; Kumar, Ajay; Kaur, Harpreet; Chadha, Neelima; et al. (5 May 2014). "Burden of Invasive Pneumococcal Disease in Children Aged 1 Month to 12 Years Living in South Asia: A Systematic Review". PLoS ONE. 9 (5): e96282. doi:10.1371/journal.pone.0096282. 1 2 Plotkin, SA; Orenstein, W; Offit, PA (September 22, 2012). Vaccines. Elsevier – Saunders. p. 542. ISBN 978-1455700905. Retrieved July 2, 2015. ↑ Sternberg, George Miller (30 April 1881). "A fatal form of septicaemia in the rabbit produced by the subcutaneous injection of human saliva. An experimental research". Bulletin of the National Board of Health. Baltimore, Maryland . ↑ Pasteur, Louis (1881). "Sur une maladie nouvelle provoquée par la salive d'un enfant mort de rage". Comptes rendus de l'Académie des Sciences de Paris. Paris, France. 92: 159 . ↑ Winslow, C.; J. Broadhurst (1920). "The Families and Genera of the Bacteria: Final Report of the Committee of the Society of American Bacteriologists on Characterization and Classification of Bacterial Types". J Bacteriol. 5 (3): 191–229. PMC 378870 . PMID 16558872. ↑ Wainer H (2014). Medical Illuminations: Using Evidence, Visualization and Statistical Thinking to Improve Healthcare. Oxford University Press. p. 53. ISBN 978-0199668793. Retrieved July 4, 2015. ↑ Griffith F (January 1928). "The Significance of Pneumococcal Types" (PDF). Journal of Hygiene. Cambridge University Press. 27 (2): 113–159. doi:10.1017/S0022172400031879. PMC 2167760 . PMID 20474956. Retrieved July 3, 2015. ↑ Avery OT, MacLeod CM, McCarty M (1944). "Studies on the chemical nature of the substance inducing transformation of pneumococcal types: induction of transformation by a desoxyribonucleic acid fraction isolated from pneumococcus type III". J Exp Med. 79 (2): 137–158. doi:10.1084/jem.79.2.137. PMC 2135445 . PMID 19871359. ↑ Lederberg J (1994). "The Transformation of Genetics by DNA: An Anniversary Celebration of Avery, Macleod and Mccarty (1944)". Genetics. 136 (2): 423–6. PMC 1205797 . PMID 8150273. ↑ van der Poll T, Opal SM (2009). "Pathogenesis, treatment, and prevention of pneumococcal pneumonia". Lancet. 374 (9700): 1543–56. doi:10.1016/S0140-6736(09)61114-4. PMID 19880020. ↑ Claverys JP, Prudhomme M, Martin B (2006). "Induction of competence regulons as a general response to stress in gram-positive bacteria". Annu. Rev. Microbiol. 60: 451–75. doi:10.1146/annurev.micro.60.080805.142139. PMID 16771651. ↑ Engelmoer DJ, Rozen DE (December 2011). "Competence increases survival during stress in Streptococcus pneumoniae". Evolution. 65 (12): 3475–85. doi:10.1111/j.1558-5646.2011.01402.x. PMID 22133219. ↑ Anderson, Cindy. "Pathogenic Properties (Virulence Factors) of Some Common Pathogens" (PDF). ↑ Pikis, Andreas; Campos, Joseph M.; Rodriguez, William J.; Keith, Jerry M. (2001). "Optochin Resistance in Streptococcus pneumoniae: Mechanism, Significance, and Clinical Implications". The Journal of Infectious Diseases. Oxford University Press. 184 (5): 582–90. doi:10.1086/322803. ISSN 0022-1899. JSTOR 30137322. PMID 11474432 – via JSTOR. (registration required (help)). ↑ Zheng CJ, Sohn MJ, Kim WG (2006). "Atromentin and leucomelone, the first inhibitors specific to enoyl-ACP reductase (FabK) of Streptococcus pneumoniae". Journal of Antibiotics. 59 (12): 808–12. doi:10.1038/ja.2006.108. PMID 17323650. Wikimedia Commons has media related to Streptococcus pneumoniae. Centers for Disease Control and Prevention (2012). "Ch. 16: Pneumococcal Disease". In Atkinson W; Wolfe S; Hamborsky J. Epidemiology and Prevention of Vaccine-Preventable Diseases (12th ed.). Washington DC: Public Health Foundation. pp. 233–248.